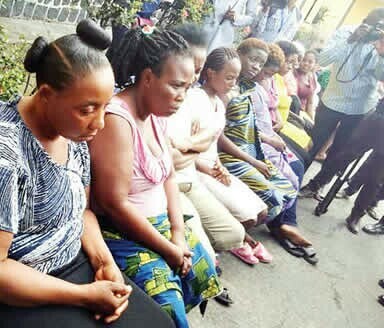 Rivers state police command has arrested 16 pregnant women in a sting operation carried out on the premises of one Gloria Raphael, who is the General Overseer of Mountain Sinai Ministry at Rukpokwu . Also arrested alongside the 16 pregnant girls are three other persons helping the Pastor to run the baby factory. Briefing journalists at the Rivers state police command, the State Commissioner of Police, Zaki Ahmed, said that Pastor Gloria Raphael was engaged in child trafficking in the guise of operating a legal business. “ Sixteen pregnant women awaiting delivery and onward sale of the children to the waiting buyers were arrested. One of them by name Chinyere Nweke had labour on the day of arrest and was rushed to the police clinic where she gave birth to a baby girl,” Ahmed said. When questioned why she was arrested, Gloria Raphael stated, “ There was a day my sister, Esther Joseph, called me to come and help her; that somebody was sick. One of the pregnant lady, Sandra Solomon, explained that she was told that she could sell her baby to a Church when she discovered that she was pregnant.